Hey snow lovers! 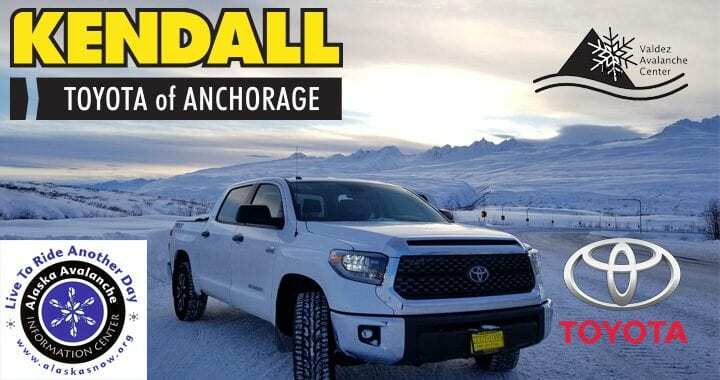 The Alaska Avalanche Information Center here with your weekly Snow Riders report thanks to Kendall Toyota of Anchorage and Classic Country Legends 100.9. Watch for warmer temperatures with periods of snow and rain this weekend across south central Alaska. Wind slab avalanches have been observed this week in Hatcher Pass. Forecasters across the state have also noted persistent weak slab and cornice hazards. Valley Trails are open and groomed making for a great time to get out and enjoy spring riding and touring. Trails north on the Parks Highway around Big Lake, Nancy Lake, Petersville and Cantwell are reported in good condition. Forecasted new snow this weekend for the Eureka Lodge, Lake Louise, and Glenallen should freshen up the trails. Ride with caution around waterways and stay alert for overflow. Conditions on the Turnagain have been reported as steep, deep and wet. Make sure you are prepared with the right gear and always check the snow and weather forecast before heading out. If you find a notable hazard in the backcountry, share your photos and stories at Alaska Snow dot org. Posting your observations could help others avoid accidents and injury. That’s it for this week. Always check the snow forecast before heading out at Alaska Snow Dot org. Stay safe out there and take care of your friends so you can all live to ride another day!